Jayesh Shah, consultant at Corporate Citizenship, explores how a new development financing mechanism can channel finance to help achieve positive societal outcomes, as well as returns for investors. We recently celebrated the first anniversary of the Sustainable Development Goals (SDGs) – a universally agreed set of goals, targets and indicators that will shape the development agenda until at least 2030. A year on and it’s still too early to assess progress. Whilst the debate over the framework of indicators and quality of statistical data leaves the viability of all future measurement wide open, the cracks in financing the goals are clear for all to see. A UNCTAD report estimated that the additional finance required to fund only the infrastructure (physical and social) needs associated with the SDGs for developing countries alone will be at least $2.5 trillion per year until 2030. Whilst public financing, including from Official Development Assistance (aid budgets), will continue to be important, there is recognition that significant increases in private financing will be required in order for the SDGs to be successful. The challenge is that the drivers of private finance are distinctly different. Investment opportunities are judged on commercial risk-return considerations, so investment models should follow suit. This article considers these models – know as ‘blended finance’ – assessing development impact bonds (DIBs) in particular, and whether they can act as a catalyst to bridge the funding gap for the SDGs. Blended finance is the use of public funds to leverage private investments in development. Launched by the World Economic Forum and OECD in Addis Ababa in 2015, it has been positioned as the fancy new tool that will ‘unlock hundreds of billions of dollars to accelerate economic, environmental and social growth and progress across emerging and frontier markets’. The idea is that actors such as governments and aid agencies will underpin commercially viable solutions through removing constraints and mitigating risk. This will in turn incentivise larger scale commercial investment into development. Impact bonds aimed at delivering specified outcomes for society are one of the more apparent forms of blended finance, artificially generating financial returns for commercial investors. Based on payment by results, impact bonds are not a new concept dreamt up for the SDGs. The UK government first issued a social impact bond (SIB) in 2010, aimed at cutting reoffending rates in a Peterborough prison. Development impact bonds (DIBs) represent the latest evolution of payment by results, the key difference being that a commercial investor rather than the government provides the capital, absorbs the risks, and is then paid a premium only if the results are achieved. So far there are two operational DIBs – an investment in Peru supporting coffee and cocoa farmers and the Educate Girls bond in Rajasthan, India. In the case of the Educate Girls DIB, UBS Optimus Foundation has provided the capital to fund a programme aiming to increase education participation rates and performance levels for 18,000 girls. 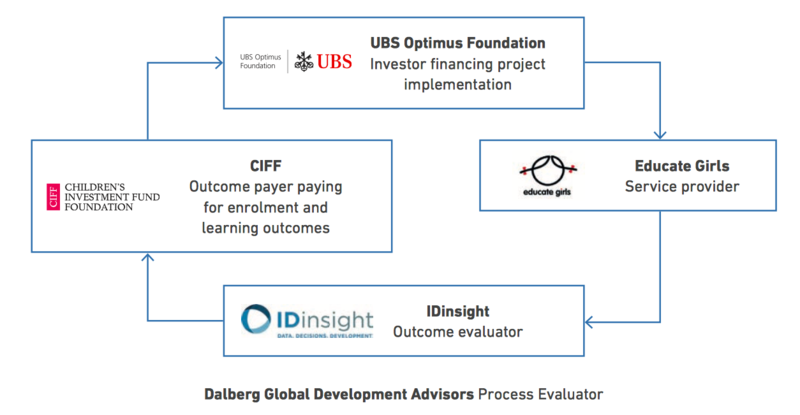 Progress is measured by a separate ‘Outcome evaluator’, in this case IDinsight, and if the results are achieved then the ‘Outcome payer’, the Children’s Investment Fund Foundation, will repay UBS’ initial outlay plus an agreed return. The advantage is of course that the Foundation only spends when the results are achieved and therefore takes on none of the risk inherent in development programmes. So far the DIB is on track to achieve its first year results and there is clear potential to roll out the programme to other Indian states over time. Its focus on an outcomes-based approach, which is fundamental for a DIB to be operational, has the wider benefit of allowing the delivery partner more freedom to innovate in its delivery approach. Taking a step back from the Educate Girls programme, it is worth considering the potential of DIBs as one possible financing solution for the SDGs. As a group of funders, it’s likely to require opportunities greater than $10 million for the institutional investor community to take notice. Anything less is fine as a proof of concept, but won’t stack up as a viable commercial investment. The second point is that with a large outlay comes an expected return: if DIBs are to become viable, the return must be commensurate with the risk. If this balance can be struck, then the potential for investors to divert a proportion of the total assets under management, expected to exceed $100 trillion by 2020, can have a tangible impact on resourcing the development agenda. However, an early challenge already halting some DIBs is high transactions costs. DIBs take time and effort to formulate: this questions whether they can be easily replicated. From a theoretical perspective, it is also worth considering DIBs within the context of the SDG project – to involve all functions of society in transforming our world. It could be argued that DIBs provide the first realistic opportunity for the institutional investment community to align their own sustainability interests with this global development agenda. It’s not to say that the financial proposition need not make sense, but more that DIBs offer an incentive to engage in the SDGs in a way that the investment community hasn’t seen before. As with any partnership, the institutional investment community has more to offer than just its cash. Its focus on an outcomes-based approach, which is fundamental for a DIB to be operational, has the wider benefit of allowing the delivery partner more freedom to innovate in its delivery approach. However investors will also be vulnerable to the moral suggestion that they are, in essence, profiting from the poor. This is harder to argue against until you look back at SDG funding gap that needs filling. In the backdrop of the significant achievement of agreeing upon a set of global targets sits the $2.5 trillion annual investment hole that public financing cannot fill. The upshot is that achieving the SDGs already relies on new models of investment from the private sector, and the ‘blended finance ecosystem’ is designed to serve this exact purpose. Whether it will be successful or not, and there is little existing data available on current achievements, there is a strong momentum behind innovative financing models. Platforms such as Convergence are already facilitating connections between private, public and philanthropic investors in blended finance deals. If DIBS can be structured correctly they represent one powerful mechanism to bridge the investment gap, allowing countries to fund their own development agenda without assuming the risk. Looking ahead, the key test for DIBs will be whether they can be replicated and scaled to grow into true bonds — a tradeable asset class – rather than a very niche results-based financing mechanism. Jayesh Shah is Consultant at Corporate Citizenship. This article is republished from the Corporate Citizenship blog.